Yes, I knew this already. But they recently went out of their way to remind me of it. Thursday night at Thanksgiving dinner my mother mentioned that she was saving up airline points so she could get a new MacBook. The next day I notice that io9 has a "Black Friday deals" post and I can get her a 13.3" MacBook Air for $950. It's at Best Buy, so I consider it carefully, but these things don't go on sale all that often so I figure I'll give it a try. Five minutes after I order the thing, I get an e-mail that the order has been cancelled because they "were unable to verify my information." So I call to fix everything. Of course, the number on the e-mail can not take orders. Somebody will call me in 48 - 72 hours. I asked, that wasn't 2 - 3 business days, it was 2 - 3 real days. 96 hours later, no call. So I called back. Again, that number can't help me, so they transferred me. Thirty minutes on hold and the person who picks up can't hear me. I have to call back. First I make several other phone calls. Nothing wrong with my phone so I try again. Thirty minutes later, same result. I have three different cordless phones next to me to try, they can't hear me at all. I call again, ask to talk to a supervisor. I get transferred to an empty voice mail box that can not take messages. I call back. This time I get a Best Buy employee who tells me she can't help me, her boss can't help me and her boss' boss can't help me. She can only take new orders. All she can do is transfer me to that same number where I will sit on hold for another thirty minutes and who knows if they can hear me there. I decide to get off the Best Buy hamster wheel. So I go on line to find one. Who has the best price? Best Buy. Fortunately, Amazon matches that price because at this point I will pay at least $100 more to avoid dealing with them. The moral of the story is one you probably already know. 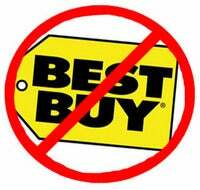 Time is money and Best Buy would rather have your time. Get your stuff from somebody else.